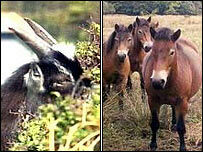 Poisoned peppers found in North Devon were meant for Lynton's infamous wild goats or Exmoor's famous ponies, the RSPCA fears. The charity wants to find those responsible for leaving the vegetables near the Valley of Rocks in Lynton. 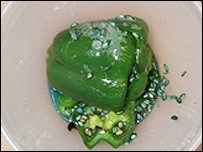 Twelve green peppers were found stuffed with what is believed to be caustic soda crystals and baited blue grain, similar to rat poison. The goats have long divided villagers because of the damage they cause. The 80-strong goat herd grazes in the 300-acre valley in Exmoor National Park. The goats, which have roamed the Valley of Rocks for hundreds of years often cause trouble by eating flowers in the cemetery and damaging local gardens. They are described as "destructive and dangerous pests" by some locals, while others have claimed they are an important draw to tourists. The poisoned peppers were found near a shelter in a public area by a member of the public who was out walking in the Valley Of Rocks on Friday - in an area frequented by the wild goats and Exmoor ponies. RSPCA Chief Inspector David Steele said whoever left the peppers probably believed the animals would mistake them for apples. But he said they could easily have been consumed by birds and other wildlife. The Department for Environment Food and Rural Affairs (Defra) has been informed and the poisoned peppers have been sent for analysis. "As far as we are aware, no animals have been poisoned by this incident, but it could be a very different story," Ch Insp Steele said. "It is vital we find out who is responsible for this incident so they don't attempt to do the same thing again." In May 2005, the goats were given a reprieve when the town council abandoned its plans to cull them, in favour of installing a new cattle grid. However in January this year, about a dozen billy goats managed to cross the £40,000 grid, again bringing havoc and damage to Lynton. Town Clerk Geoff Dwyer said he was "disgusted" by the discovery of the peppers. "If, and it's a big if, this is aimed at the goats, I think its absolutely appalling," he told BBC News. Mr Dwyer said children, dogs, feral cats, badgers, foxes and birds - including a pair of nearby peregrine falcons - were also being put at risk.